Logical Partitioning for OS/400 opened the door to significant operational advantages and cost savings for iSeries and System i clients. You can now manage production workloads from many iSeries servers on a single newer server using LPAR technology. And, in an System i world, you can now consolidate additional operating system environments onto a single System i footprint. 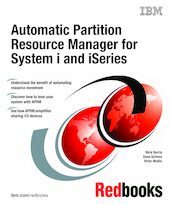 This IBM Redbooks publication is about setting up a partitioned iSeries or System i system. The primary focus is about making it possible to share system resources between and among partitions easily, flexibly, and safely. The contents of this book include information and a practical example of how to use an iSeries and System i server tool, Automatic Partition Resource Manager (APRM®) from Barsa Consulting Group, LLC, to help transform a company's infrastructure into an on demand, self-healing environment.